Sicario: Day of the Soldado is a true marvel of evil entertainment and ill timing. It is an exploitation film that is exploiting an extremely serious crisis that is happening right now at the US-Mexico border, as thousands of children remain separated from their parents due to the wanton cruelty and moral degeneracy of the Trump administration. Swaggering into the eye of this maelstrom of human misery, the film feels like it was ripped straight from the fascist imaginary, gleefully structured as it is around a plot featuring child abduction, Islamic extremism, the persistent dehumanization of migrants, torture, and a grim extraterritorial ultra-violence deployed in the service of American empire. Filled with hard men doing bad things, Sicario: Day of the Soldado reads like a topological survey of the various fears, paranoias, and racial animae of the American right. It is also something of an aspirational cultural object for them, a letter of intent, a tribal statement of purpose: this is who we are and this is what we can do to you. Directed by Stefano Sollima and written by Taylor Sheridan, Sicario: Day of the Soldado is a joyless slog through the psychic terrain that is the fascist brain. Sheridan is a screenwriter much fêted and too little critiqued, with a disturbing penchant for penning stories that rely on the actual existing environments of people of colour that ignore their perspectives and subjectivities in favor of perpetuating stale stereotypes about them. There is nothing Sheridan likes more in a script, it seems, than to have brown bodies (preferably dead, so they can’t speak) occupy central places in narratives built around white lawmen strutting and fretting their hour upon the stage. It’s a tendency he indulged in with his script for Hell or High Water (2016) and then took to egregiously absurd heights in his White-Saviour film Wind River (2017). Sicario: Day of the Soldado is the most natural extension of an art form that Sheridan has nearly perfected, and in his script for Soldado he is channeling all of the hellish rage and racial resentments of Donald Trump’s America into a potent discursive bombast – with Latin American migrants and Muslims bearing the brunt of his vitriol. Opening with a head-bangingly offensive sequence detailing how Mexican drug cartels have now linked up with ISIS terrorists to help smuggle them across the US-Mexico border, Sheridan’s script immediately vaults us into intellectual territory that has long been the sole province of right wing conspiracy theorists and fascist politicians, as the idea of some connection between Islamic extremists and the Southern border of the US is one with a long and insidious political history. Signal boosting this paranoiac nonsense was US Rep. Duncan Hunter, who went on to claim – falsely and without evidence – that as many as ten ISIS militants had been captured at the US-Mexico Border. In an interview with a conservative news outlet he asserted, “ISIS is coming across the southern border. They aren’t flying B1 bombers bombing American cities, but they are going to be bombing American cities coming across from Mexico.” Later in 2015, a story surfaced on social media about a possible ISIS training camp near El Paso Texas, which gained significant purchase in the conservative blogosphere before being disproven. All of this is to establish that the animating premise on which Soldado is predicated is quite literally the product of a pernicious and frequently recurring conservative fantasy – one constructed for the sole purpose of linking two of the things they hate most (Muslims and Migrants) in one potent narrative thread. Capitalizing on this pre-constructed conspiracy theory and the deep rooted racial anxieties of the American right is what Soldado does best, and the film manages to serve up some of the most racially incendiary images you are likely to see on a screen this year. Within Soldado’s first ten minutes we watch as an Islamic extremist blows himself up in what looks to be a Walmart – but not before cornering a white mother (blonde, of course) and her young child, who plead for mercy – only to be ignored and cruelly eviscerated. As if to further draw this connection out, after the woman and her child are blown to bits the film cuts to a desert scene where a disrupted convoy of migrants is combed by federal agents. Three prayer rugs are found lying in the sand, and they linger in the frame long enough for the audience to appreciate the iconographic connections being established between the Islamic faith and acts of violent barbarism perpetrated against white Americans. The only Islamic extremist we meet in Soldado who actually says any words other than “allāhu akbar” is a black man, and we meet him as he is being tortured by US Special Op’s head Matt Graver (Josh Brolin). Graver informs his captive that “This is Africa: I can do whatever I want to you,” before forcing him to watch drone feed footage of his entire extended family being slaughtered. The whole scene feels like an obvious bit of MAGA chest-thumping in it’s uncomfortable actualisation of the inhumane anti-Geneva Convention treatment Donald Trump promised during his campaign for president, when he asserted that he would kill the families of terrorists as retribution for any attacks on the US. These political resonances aren’t accidental, and Sheridan’s script is following in the footsteps of a sordid tradition of instrumentalizing black and brown bodies for the cultural consumption of white audiences. Soldado sees Sheridan and Sollima traffic in some of the most vile racial imagery existent in media today, and they deploy many of the same representational and rhetorical strategies that are so ruthlessly weaponized by the far right. This is filmmaking that cannot be merely written off as irresponsible or inflammatory. Many of the images in Soldado seem to be specifically calculated to play directly to right wing anxieties, and to fan the flames of racial animosity. The film is positively obsessed with shattering norms and breaking rules. At one point after a particularly bloody skirmish with Mexican Police officers at the Southern Border, Graver is told by a superior that “POTUS doesn’t have the stomach” for his sort of violent tactics anymore. His response is to snarl, “Sit that coward down! This is why nothing ever changes!” Graver functions as the cinematic paragon pure of American muscularity in Soldado, and his moral and tactical eminence is never challenged, even when he is massacring civilians through drone strikes or engineering the kidnapping of a child. Pitted against adversaries who are either more morally debased than he (Islamic terrorists) or weak-willed (politicians), he is rendered valiant by comparison. After the film has had its fill of portraying Muslims as brutish fanatics, it shifts its efforts towards the dehumanisation of migrants. As a response to the terror attacks inside the US, the President in the film labels the Mexican cartels as terrorist groups and declares open season on them. Turning to Brolin’s Graver, the Secretary of Defense orders him to destabilise the cartels by creating infighting between them (like the US did in Afghanistan), thus disrupting the flow of migrants into the US. The way they decide to accomplish this is through kidnapping the sixteen year-old daughter of a major cartel head and making it appear as if a rival cartel was responsible. 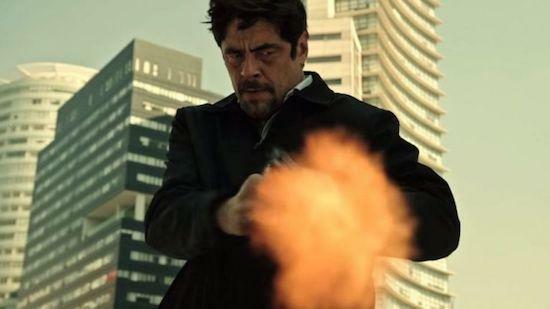 Graver links up with his old friend Alejandro (Benicio Del Toro) to spearhead this false flag operation, since the cartel head in question is the same one who murdered his family some years before. Soldado is a film that is structured around the premise that the US government has a right (and even a duty) to kidnap children for political purposes. The film is built entirely around this notion, and there is absolutely no escaping its centrality to the plot. It shouldn’t be surprising that there is no moral calculation being made around the US government kidnapping a Mexican child in Soldado, separating her from her parents, traumatizing her, exposing her to all manners of violence, and holding her hostage for political gain, because we now know that the US is a country where this has been occurring on an industrial scale; with some 4,100 migrant children separated from their parents at the US-Mexico border according to the latest count. Latinx children are very much at the narrative center of Soldado, though they are never allowed to appear on screen as anything more than stereotypes. When we aren’t watching kidnapped cartel daughter Isabel Reyes (Isabela Moner) play the victim, we are following the story arc of a Mexican-American teenager named Miguel (Elijah Rodriguez) as he is swept into the world of human trafficking. Miguel’s subplot is perhaps the most baldly racist element in Soldado, as it traces his metamorphosis from a normal law abiding American kid in McAllen, Texas (the real life home of the largest immigration processing center in the US) to a slick tatted up Coyote with a limitless capacity for criminal violence. Sheridan wants it to be crystal clear, in case you were wondering, that for him this isn’t a question of citizenship status. The enemy is already here, not only at the Southern border, but all around us: they even have American passports and Social Security cards. How can you spot a criminal? Just look at the colour of their skin. The potential is there; just give them some time to grow into it. Sheridan and Sollima’s racist fantasies have unfortunately become inextricably bound up with our political reality, and as a cultural object Soldado seems to exist only in order to reify a suite of damaging stereotypes about people of colour. It offers no cogent critique of the brutal policies it presents, and it never once considers the perspectives of the migrants whose misery it is so happy to exploit for its scene-setting. Almost every single Latinx we see in the film is a cartel member who is linked to gangs or human smuggling and there is a total lack of humanity when it comes to portraying migrants on screen. Sheridan doesn’t deem it necessary to explore the actual lived reality of these people in his script, nor does he have any curiosity about the reasons they make the perilous journey across the border. Observing a huddled mass of indistinguishable Latinx bodies, we watch as one Coyote quips to another, “they’re sheep, treat them like it,” and it feels almost like a Brechtian aside – it’s as if Sheridan is giving away his own game. Earlier in the film Del Toro’s Alejandro remarks of Mexico that “luck doesn’t live on this side of the border,” and in Sheridan’s writing, neither do actual people. The biggest problem with Soldado is that it is a recreation in sound and image of the same dystopian present that so many on the far right seem to believe to be their actual lived reality. The film exists in order to reflect and amplify the fears, paranoias, and racial prejudices of these people, and to add another cultural brick in the wall of the parallel world-building exercise they have long engaged in with their talk radio shows, news programmes, and websites. In presenting America as overrun by ISIS and Latinx migrants, Soldado breathes fresh life into the fascist cultural imaginary, abetting a tribal fantasy of white dominance that serves to give far right viewers a new level violence to aspire towards. The motto of Sicario: Day of the Soldado is “no rules this time,” and we know this because it’s a phrase that is repeated in at least three different scenes in the film. In many ways this also feels like it could be the motto of our current political moment as well, where Donald Trump’s brand of aggressive lawlessness is ascendant. America feels like it is sleepwalking through the twilight days of liberal democracy, marching ever closer towards a full autocratic turn. It is important to recognise that anti-fascist resistance must extend to the realm of cultural criticism for the very fact that we did not arrive at this horrific juncture in our politics without the active collaboration of the culture industry. It is simply politically untenable to separate migrant children from their parents, to traumatise them, and throw them in indefinite detention camps, if they are not first thoroughly denigrated in the cultural imaginary. Films like Sicario: Day of the Soldado, with their racially incendiary imagery and dehumanising stereotypes lay the groundwork for real world horrors to come. Such evil entertainments must be resisted wherever they are found.